The economy must have been hit harder than expected, given that so many Austrian Economists have switched to being only part-time Austrians, and otherwise thoughtful economists (whether Austrian or not) have shirked their duties. What am I talking about? I’m talking about two recent waves of libertarian appeals to poor minimum wage empiricism that would not pass the sniff test in an introductory econometrics class. A Kevin Erdmann blog post on the effects of minimum wage on teen employment. Erdmann originally regressed teen employment over time before and after the minimum wage was increased at different times in US history, concluding that there is strong evidence that the minimum wage caused the decrease in the employment trend. This article was shared by (at least) Steve Horwitz, Peter Boettke, Don Boudreaux, and Mark Perry. Evidence about the minimum wage harming teen employment you say? Evidence you shall have. Marginal Revolution, Cafe Hayek and the Coyote Blog are all featuring the chart above and the blog post about the minimum wage law government-mandated wage that guarantees reduced employment opportunities for teenagers by Kevin Erdmann on his Idiosyncratic Whisk blog. The problem with all of these authors sharing the blog post and praising its conclusion is that the evidence provided is simply useless. One of the most fundamental aspects of science is the idea of controlling for external variables. The original post by Erdmann simply regressed teen employment over time – before and after the minimum wage was increased – without including any controls. However, it is notable that at least some of the periods with minimum wage increases overlap with recessions. And when the two competing theories about why employment has fallen are a minimum wage increase and a recession, my bet is always with the recession. This is not to say, of course, that I believe minimum wages do not have teen disemployment effects. Rather, my point is that the evidence presented provides no backing for the claim, given the naive data processing performed. Not only can recessions help to explain the trends in employment, but they can also help to explain minimum wage hikes (or at the very least there is a plausible pathway): the economy goes south, so politicians argue for a higher minimum wage to help out struggling families (and win the left-liberal vote). As such, recessions are a classic example of a confounding variable in the analysis. Yet even if the analysis somehow included the effects of recessions, there would still be too many variables uncontrolled that could be causing the observable effect (Dube also mentions that state-level variation in minimum wages could have an important effect). This is fairly standard Austrian Economics 101 mantra – you can’t control the necessary variables to claim causation (at least in most situations – I believe Imbens et al (1999) to be a tantalizing attempt at empiricism Austrians wouldn’t dislike). I do not use the word “mantra” disparagingly, as I am strongly influenced by the Austrian position on empiricism and I approach all econometric studies with extreme caution. This case is no different – especially when so little work was done to rule out confounding factors. This is another piece of fairly useless empiricism. Once again, there are no controls for confounding factors. Is it so strange to think that countries that are more likely to enact minimum wages are also more likely to enact other labor market regulations that weaken the job market? 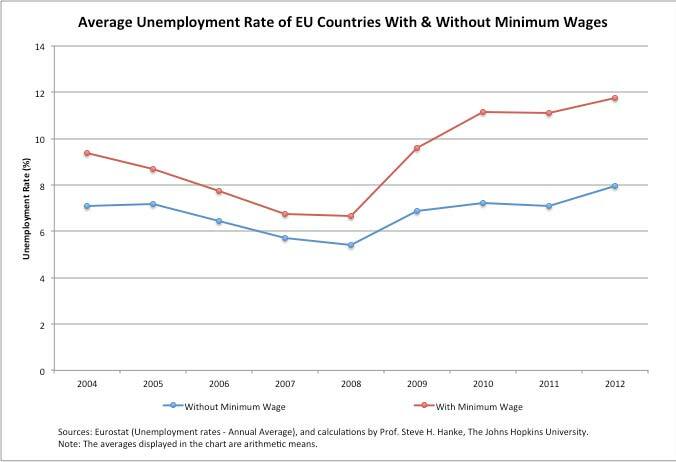 If this is the case, then what we are seeing in the graph could very well be the effect of those other regulations – and we learn absolutely nothing new about the effect of minimum wages. I am not sure whether Dr. Hanke considers himself to be an Austrian, but in either case, the argument is unworthy of being published. Sadly, the post has been propagated across at least a few websites already (including Boudreaux’s Cafe Hayek). Once again, I am not disagreeing with the ultimate conclusions of the two posts discussed above. I believe that, if not in the unemployment rate, minimum wage hikes would have impacts in other variables, some seen, some unseen – perhaps job training, perhaps the intensity of the work environment, and so on. Suppose the correlations in the two analyses ran in the completely opposite direction. That is, minimum wages tended to correspond with higher teen employment in the US over time, and minimum wage countries in Europe tended to correlate with a lower unemployment rate. What would the left-liberals do? They would parade this fact around in victory. Yet the facts are not like that, but the complete opposite. We do not see a corresponding pensiveness and pause on their side as to why the facts might not be so. In this case, this argument wouldn’t be a critique of the minimum wage policy, but of the opposition itself. This doesn’t make it bad – it points out the dishonesty of loudly parading when the data superficially supports their side, but crickets when it doesn’t. Austrians should be consistent Austrians: Do not reject empiricism when it disagrees with your policy stances and accept it when it agrees. If an analysis cannot possibly control all relevant variables, the analysis cannot be used to make a causal claim. If an analysis doesn’t even begin to attempt to control variables, then this is not science but toying with numbers. And if you don’t want to be an Austrian, then at least don’t be a sloppy economist.